The EU’s border regime is tough. News about refugees drowned in the Mediterranean no longer make the headlines. Borders along the Balkans have been closed and Germany cannot be reached without passing through a non-member country. Promises to receive refugees and supply financial aids are not being fulfilled. In many parts of Germany refugee accommodation is standing empty. Yet it is clear that there is no alternative to migration and an open society. Following the somewhat arbitrary opening of German borders in 2015 things have even worsened for refugees and migrants in drastic ways. Following widespread racist mobilisations and a shocking right-wing campaign the few improvements made of late have already been overturned again. Our action is directed against these politics. Our action is to take place inside terminal 1 of Hamburg Airport. 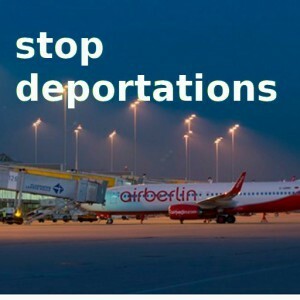 Airports are important places for deportations which in our view are one of the harshest expressions of racist politics. Here at the airport the city of Hamburg has constructed a so-called deportation custody centre where people can be imprisoned for up to 4 days before being deported. We’re not planning a demonstration expressing our rage with long spoken contributions. It is rather our goal to create images in the big hall of terminal 1. The idea is to dress up as stewardesses, ground staff, business travellers, pilots, i.e. typical airport users and to present a kind of choreography. Of course this has to be rehearsed and the costumes agreed upon. Those who think this is similar to a Punch and Judy show should be aware that it may well have good effects on the audience. Creating strong images with a message is the idea as no one will be listening to long speeches. There is a big audience in terminal 1 and it will be watching our choreographies. These choreographies will be interspersed with brief texts of a high literary quality. What counts for us is to convey a serious, dignified stance. This is not a demonstration of rage, even though we’re often full of rage. We don’t walk, we stride. We don’t scream, we talk. It is possible that this action will be fun. This should be tolerated positively. There will be texts for the choreographies which will describe the movements so that no one will have to memorise anything. For some this may be reminiscent of the Ligna Radio Ballett. It would be great if groups were prepared to take over the impersonation of a specific group. There will be preparatory meetings on choreography and costumes. The costumes are not meant for passers-by to think we are really airline staff, yet a brief moment of bewilderment is indeed intended. A Preparatory meetings for studying the choreography and arranging the disguises will take place on 3rd October at 6 p.m. in the Centro Sociale, Sternstraße. We’re looking forward to it….